Easter arrived this year when we were in a bit of a sleepless haze, but since I had anticipated that, I had planned ahead for Jared to still be able to experience the first Easter he can remember. 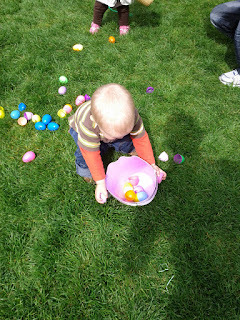 On Saturday, April 23, Todd took Jared to the San Mateo City Easter Egg hunt in Central Park. Jared wasn't really interested in the eggs until Todd asked him to help "clean up." After that Jared was enthusiastic about putting eggs in his bucket. The city's Easter eggs were empty, so Jared soon found more interesting things to put in his bucket, like sticks and leaves that had fallen from trees. 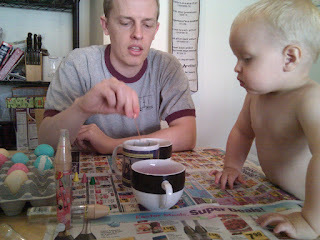 Saturday afternoon Jared and Daddy dyed Easter eggs. I would have just put the eggs in the dye, but these boys had other ideas. The eggs were colored on, dyed multiple colors, taped, and covered with stickers by the time they were done. Jared is an egg artiste. 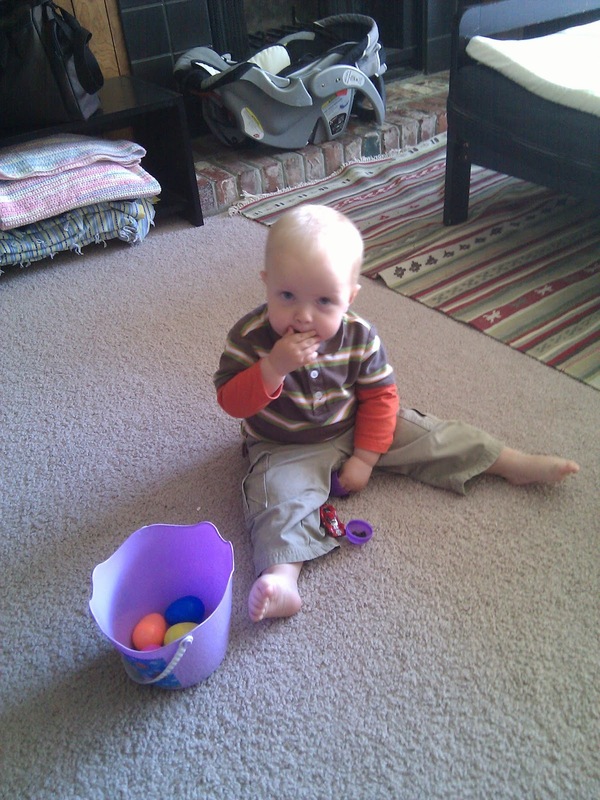 On Sunday, the Easter bunny came after naps and brought a matchbox car and some new sand toys. Jared had a great time tracking down eggs. 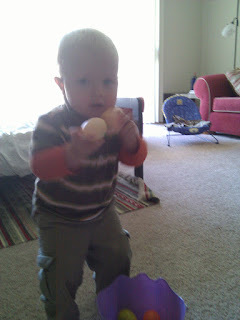 He got so excited that he decided to clap his hands with a real egg in each hand. Things got a little messy. He had a great time discovering eggs, but he was even more excited when he discovered that the Easter bunny had filled the plastic eggs with treats: raisins, goldfish, and teddy grahams. Spoils! In all of this egg-citement, Jared was quick to remind us any time he heard the word "Easter" that it is really about resurrection ("reh-rah-rah-rah") and Jesus. He tells us over and over that Daddy will be resurrected, Mommy will be resurrected, and Baby Eloise will be resurrected. I'm going to say that that family home evening lesson was a success. Happy Easter! A. *You must be away from home. B. Your parents are unprepared with a change of clothes for you. C. Your parents only have unseasonal/too small clothes for you. D. Inadequate/No diaper changing facilities are available. E. Your wipes container is down to only two wipes. F. Your parents are late/in a hurry/already in a meeting. A. Poop sideways. This will be sure to coat everything around you in a disgusting mess while doing very little damage to your diaper. B. Poop on the lap of someone holding you, but only if they are looking especially pretty and/or are not your parents. A. Scream. Loud. The whole time. B. Try really hard to pee while your clothes are off. If you are a boy (or your parents are careless), try to pee on the clean clothes that are about to be put on you. C. Flail and thrash. See if you can get both your hands and your feet in the poop, and then onto something unexpected like your clean clothes or the shirt of the person changing you. D. For bonus points, spit up and/or poop again as soon as you are dressed in clean clothes. 4. Laugh inside as your parents/caretakers become increasingly frantic about how to get you clean, dry, and calm. 5. 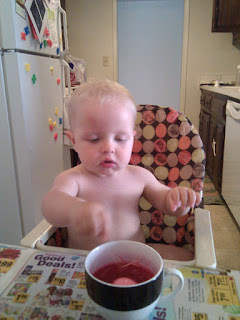 Do not create these diaper messes too frequently or you will likely find that your parents become increasingly prepared and your satisfaction and their distress will be diminished. Some parents, however, do not catch on quickly, so feel free to take full advantage of this privilege during your first few weeks of life. Thank you, Miss Eloise, for re-initiating us into new parenthood. Good job keeping us on our toes.